Welcome to another episode of "As the Hoe World Turns"
The Basketball Wives series is known to be a messy platform to expose these "wives" as the groupies that they really are. Most of the cast members have slurped and guzzled some of the same ballers so I wasn't too surprised when I came across some juicy information that involves Laura "Forever a Fiancee" Govan, her baby fava Gilbert Arenas, and Basketball Wives L.A.'s newest cast member, Brooke "Midget Features" Bailey. Don't worry, Brooke did not sample Gilbert...but her friend Terricka did! Brooke and Terricka Cason go way back. The two ladies were cast as"Wild 'N Out girls" on Nick Cannon's MTV show "Wild 'N Out" in 2006. The ladies were also the stars of E! channel's short lived series "Candy Girls"
Brooke (left) and Terricka (right) in their "Candy Girls" days. As detailed in this post, Laura and Gilbert have been together off and on since 2001. 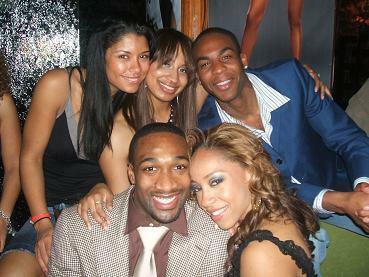 Back in 2006, Gilbert began dating Terricka. Terricka allegedly helped Gilbert plan his 25th birthday party in 2007 and was seen hugged up with him all throughout the club where the party was held. Poor Laura was at home pregnant while her baby daddy and his jumpoff partied the night away. Terricka is no longer messing with Gilbert because she has another basket case to deal with: her husband, NFL player Antonio Cromartie and his 10 kids (the couple have one child together, Cromartie has nine other kids from previous relationships). Terricka really scraped the bottom of the barrel with that one. That girl wanted a baller so bad she didn't care who he was! But don't get me wrong, Terricka is not above the drama. 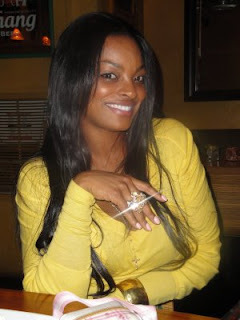 After the season one reunion of Basketball Wives L.A., she confirmed that Laura's sister Gloria did indeed sleep with Gilbert as well. I had intended to pull up the tweet as evidence but I did not have the time or patience to go through Terricka's timeline. So, what does all this mean? Well, I'm pretty sure that the producers are aware of the connection between Brooke, Laura, and Terricka but will they be smart enough to try to get Terricka to make a guest appearance on the show to stir up some drama with Laura? One can only hope. Hmmm... they are pretty equal in the looks department to me. Now THIS is what they need to put on the show! I am beyond bored with these ladies, they need something to spice things up. UGH! Why didn't they bring this up on the show???? !